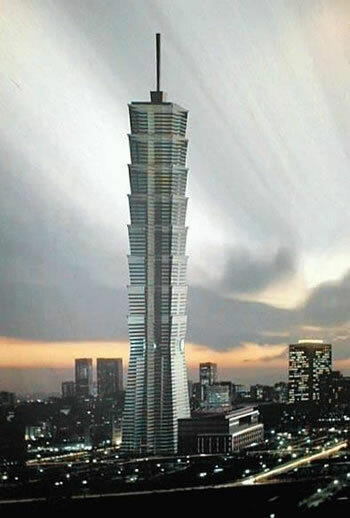 Toshiba Elevator and Building Systems Corp announced the installation of the world's fastest passenger elevator just exactly where it is needed - in Taipei 101, the world's tallest building. The elevator runs at a top speed of 1,010 meters per minute when ascending (600 meters per minute on the way down), which works out ot 60.6 kilometers per hour. And it's official; Guiness has certified it for the 2006 edition. Elevator technology is more important than it looks; the invention of the safety elevator by Elisha Otis in 1857 and the subsequent introduction of the gearless traction electric elevator in 1903 allowed designers to create high-rise buildings that people would actually use. The only thing that would make this Toshiba elevator more cool is if it made use of gravitic repulsion. Speaking of which, check out the over-the-top gravitic repulsion elevator, from Isaac Asimov's 1951 classic Foundation. I can't believe there are very many science fiction elevator enthusiasts, but for those of you who can't get enough elevator news, check out the elegant undersea bubble elevator from Saturn's Race, by Larry Niven. And of course the bounce tubes, from Robert Heinlein's Double Star - they skip the actual elevator car itself. And don't forget what must be the ultimate tallest elevator - the space elevator from Arthur C. Clarke's The Fountains of Paradise. See the toshiba elevator press release and the detailed elevator engineering description; hat-tip to Roland (more info on the building at his site).